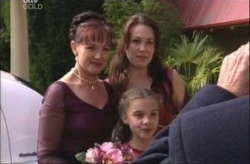 Libby gives Susan a copy of the original wedding certificate and Susan tries to remember the vows. Joe finds a positive pregnancy test kit and thinks it's Michelle's, so tries to ring her. 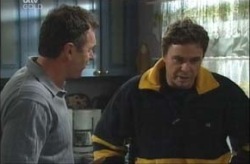 Karl tells Joe to calm down when he finds the beach house phone isn't answering. He insists it's Lori or Michelle. Karl discounts Lori, so Joe thinks it must be Michelle and gets very angry, seeing it as a reflection on him as a parent. Karl goes off to get ready. Harold tells Rosie he's received a call from Derek, Ruby's son, to thank him for the $1500--but he gave Ruby $2000. She wonders what happened to the other $500. Michelle rings Joe to say she'll be back soon, but has a fragile stomach. Dee calls at the Kennedys', where Lyn's doing Susan's hair, and takes Ben off to look after him. Summer arrives and asks if they need a flower girl. They pretend they forgot and take her up on her offer to step in. Joe rings Lyn but she's very impatient with him as she's so busy and brushes him off quickly. Rosie tries to persuade Harold that he should ask Ruby and give her the benefit of the doubt rather than jumping to conclusions. Ruby comes in just in time to overhear. She wants to know what doubt, so Rosie leaves them to it. Heather has gone to see Boyd to collect a windcheater she'd left behind and is about to leave when he gives her the street sign. He admits it was made for them after they were caught out trying to steal one. He asks if they can get back together, apologising for all the things he's done. Ruby says she gave $500 to her other son, who's out of work, not knowing she'd be 'audited'. She says she won't be able to go to the wedding as she has to meet Derek, who wants to pay back the money already. Harold accepts that, saying the money was lent without conditions. She thanks him 'for being him' and Harold smiles fondly after her as she goes. Just as all the men are ready to leave for the wedding, Joe hears Michelle's phone message and looks very worried, muttering 'morning sickness'. Susan and Libby are ready to leave. Libby says how beautiful she looks and Susan replies that she wouldn't be there without Libby and couldn't hope for a better daughter. At Lassiter's, Lyn's anxiously fluttering around and Karl's just as nervous. Summer greets Steph and suggests she sit with Max, but they both say no. Just as Susan arrives and Lyn's touching up Karl's eyebrows, Joe tries to talk to her, but can't get her proper attention. Michelle, Nina and Connor arrive in a big rush at the last minute, but Jack and Lori have decided to give it a miss as they don't really know Karl and Susan very well. The wedding march plays and Susan comes down on Libby's arm, watched by an admiring Karl and Darcy. 'I want to live with you, to have children with you, to grow old with you. I can't imagine not being with you. And I make this vow in front of everyone here today that I will love you for ever. They both start to laugh so Karl, very moved, tells the others it was their original vow and she adds that she just remembered it. She asks if he remembers his and he says he does, as though it were yesterday. KARL: Susan, I adore you with a love that knows no bounds. You are the sun, I am the.moon. You are the words, I am the tune. They exchange rings and Rosie congratulates them, telling him to give her a kiss. Susan has made a speech and ends by thanking everyone for all their support over the past months. She says her 'second husband' would like to throw the bridal bouquet and garter. Karl tosses them and Max catches the bouquet, Steph the garter. They join Susan and Karl for the first dance. Summer looks on and comments to Boyd that they make a good couple. When he says he's glad Karl and Susan are back together, she corrects him-'no, Dad and Steph'. While Karl takes her off to dance, Susan talks to Steph, who says what a wonderful ceremony it was, then goes off to mingle. Max apologises to Steph for treading on her toes. She asks about the reaction to their catching and goes on to say that 90% of their family and friends seem to be getting a perverse pleasure out of seeing whether they'll become an item or not. What are they going to do about it? He answers that since ignoring them doesn't seem to be working perhaps they should fight fire with fire and just go out on a proper date. Just then, Summer takes their photo. Joe demands that Michelle and Connor go outside with him immediately. Susan comments that Darcy is alone for once and he tells her he and Chloe have 'moved on' as she knows he will want children and she can't do that. He tells her that he realises he could have had that once but let it get away and they both look at Dee, who's just outside with Toadie. Karl interrupts to say he's left the iron on so has to go home immediately. Susan starts to say that's ridiculous, but sees he's brandishing a champagne bottle and tells Darcy they must go and check this iron. Darcy just laughs as she rushes off after Karl. Outside, Michelle is protesting to Joe that the test isn't hers. He queries the morning sickness which she explains was too much chocolate cake. JOE: Well someone in the house took that test and it wasn't me! LYN: It was me. I mean, I was going to tell you tonight but........so we're going to have a baby. Joe and Michelle look stunned as Lyn smiles.